The second part of my winter beauty series is focusing on makeup! I know when winter rolls around the trends dictate we get out the berry shades and high coverage foundations for flawless skin and dramatic makeup. Though is it me or is flawless skin always a trend, in summer it's sheer makeup... and flawless, dewy skin. Hello, that's totally unattainable for 70% of us all year round (if you have perfect skin, then lucky you! can we swap?). Most of my makeup fits into one makeup bag, granted it's starting to overflow, but still. I don't have much in the way of variety and am quite the creature of habit, however I have a few new things to introduce this winter. Starting with base, I have a lot of options for foundation and concealer as I'm always on the hunt for something perfect for me, it hasn't happened yet but I have to say that the Jane Iredale GlowTime* has come in pretty close. This is a full coverage BB cream, it's thick, long lasting and serious business. I seriously think it deserves more love as this is an amazing foundation! I have the shade BB5 which is a pale yellow toned shade, its almost perfect, though I think perhaps I'm closer to BB3 in winter as it's a little more neutral. You need the smallest amount and then you get busy blending. It offers really good coverage and has a skin-like satin finish and most importantly doesn't feel like you're caked in foundation. I will try and remember to post a full review with some swatches in the near future if you'd like? I tend to be pretty basic with my makeup and often forget to include highlighter so I'm going to try and get on that more for a wintery glow, if that's even humanly possible ;) I love ILIA Polka Dots & Moonbeams as its a subtle silver shimmer and not at all in your face, it looks really pretty down the bridge of your nose and brow bone. I really should use this bad boy more! For lips I'm pretty much a broken record, ILIA Arabian Knights & Jump Tinted Lip Conditioners, perhaps my favourite lip products ever. Arabian Knights is perhaps the more festive choice and the one I will reach for most but I find Jump wakes up my complexion a little more with that gorgeous fuchsia hue. I also keep the Burts Bee's Lip Shimmers on hand as I love that peppermint tingle and the colours are really flattering, I think the one pictured above is cherry*, a sheer red. And finally, eyes! I'm perhaps the worst, cack-handed eyeshadow applier in the world but I have this super pretty Kjaer Weis Eyeshadow in the shade Green Depth* that I'm dying to use. Just look at that golden shimmer. I think I'm going to have to get serious watching some youtube tutorials for this as dark green is a unforgiving shade should you slip up! I think it will look nice used as liner too which should be easier for me to manage! You can't go wrong with Kjaer Weis. Do you pull out the berry shades in winter? Hey Annabel. I love Ilia lipstick and I do love a deep berry colour for winter but not every day. I stick to neutral for my daily make look as well. Thanks for the review of the Jane Airedale bb. I've been needing a liquid foundation but not willing to splash out the cash in something untested! Think I've found the one to go for. 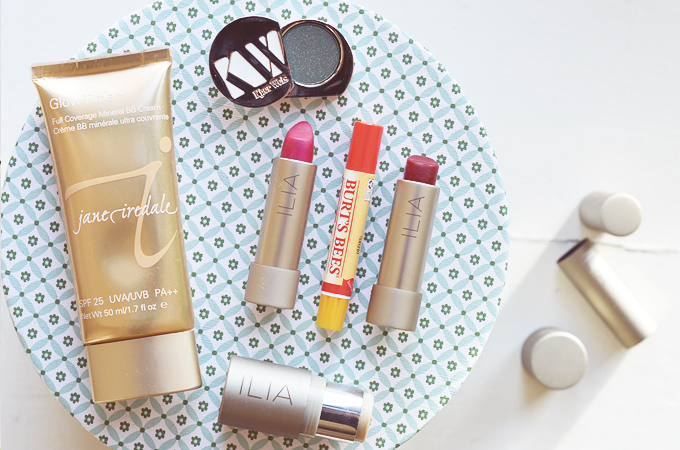 I am a big fan of Ilia as well and have been eyeing that gorgeous highlighter, as well as their new lipsticks. Also, I've been wanting to try out more from Kjaer Weis. It is such a beautiful, quality brand.